(Text automatically translated) Typical Charentais farmhouse, the neat and decor, to any trade outside a village. One house on this entirely private propriété.Piscine and heated to 28 ° in summer, large garden not overlooked and little wood unfinished. Quiet neighborhood near the forest .. Several terraces, a large shaded. Super warm kitchen (American fridge, dishwasher, microwave, stove burners .. 6) 4 bedrooms, 3 with private shower and toilet. Petanque, table football, darts. Our stay at Chassenuil sur Bonniere villa. The property is really brilliant with great facilities including lovely pool, well equipped kitchen, comfy beds,large garden, secure off road parking and surrounded by attractive countryside. The local town is close by brilliant with plenty of shops and everyone was very friendly the bistro near the church is highly recommended with good home cooked food and local beer, not to be missed. We attended the Angouleme Circuit des Remparts which was highly enjoyable. The house has masses of character, the garden is large and secure and the pool, although the pool is small it’s lovely and warm with large sitting area. The house is very well equipped with everything one could need, and more for an enjoyable holiday. Chasseneuil is a typical French town with all amenities within an easy walking distance and Angoulême, Confolens and Brantome are all an easy drive. Owners very helpful, the dishwasher broke down while we were there and a technician arrived very promptly. We would recommend this property for a relaxing holiday. We were delighted with the house - it was much bigger than it looked on the photographs and it was beautifully decorated. We managed to eat outside every day and for every meal even though the mornings were a little cool! We enjoyed some very relaxing pool days and even when we went out to visit the surrounding region we hurried back so that we could use the pool during the afternoon. Places within easy reach and worth visiting are Angouleme, Limoges, Perigeux and Brantome; we went as far as Bordeaux which, although a long drive, is well worth it! Chasseneuil has all the shops you need and we were spoilt for choice as to which boulangerie to cycle to each morning to get our croissants and baguette. 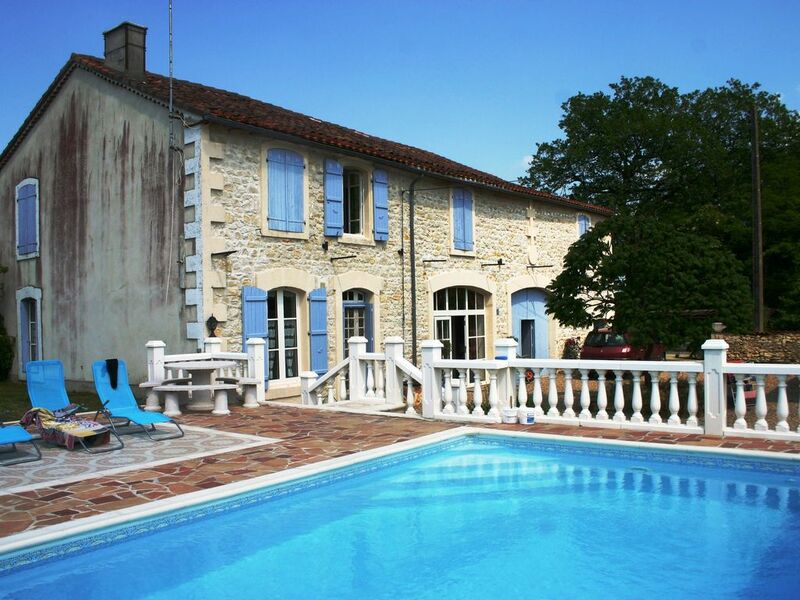 A fantastic holiday in a lovely region in a delightful house helped by the friendliness of the owner's agent. Très jolie maison, très bien équipée. La piscine chauffée est très agréable. Le cadre est superbe et la maison bien au calme. Nous avons passé un très agréable séjour. Une belle piscine et une maison bien equipé dans un environnement rustique !! Nous recommandons vivement cette location. Très bien située, au calme mais proche du village et de ses commerces, cette maison, spacieuse et au style campagnard offre de beaux volumes pour une grande famille. Les pièces à vivre sont très bien équipées et les chambres très confortables avec douche et WC pour chacune. Les extérieurs sont à l'abri des regards, la grange très festive pour l'été et l'ensemble terrasse/piscine très fonctionnel pour se bronzer au soleil. Un séjour à refaire certainement l'an prochain pour un prix très correct et des propriétaires très réactifs et sympa! (Text automatically translated) of PARIS: take the A10 motorway and the N10 until Mansle. Follow La Rochefoucauld then Chasseneuil on Bonnieure. In the village center follow Cellefroin D62. The house is 300 mà left just outside the village. Burgundy / N 10 Follow Angoulême and Limoges on the D141 out Chasseneuil. Remise des clés par le voisin car propriétaire non présent sur place.